Hailstorm claims for damage to roofs often involve belated notification that an already old or damaged structure has been further compromised. In a recent Texas case, the court provided a primer for carriers confronting such claims, addressing a trifecta of defenses available – lack of causation, late notice, and prejudice. The case is Hamilton Properties v. American Insurance Company, 2014 WL 3055801, 2014 U.S. Dist. LEXIS 91882 (N.D.Tex., July 7, 2014). Plaintiff Hamilton Properties acquired the Dallas Plaza Hotel in 2006 and mothballed the structure in February of 2009. The hotel was insured by American Insurance Company (AIC) from February through September of 2009. In 2012, the policyholder notified AIC that it was making claim for roof and water damage allegedly sustained during a July 8, 2009 storm that dumped ping-pong sized hailstones on the city. After investigating the loss, the insured denied liability, and Hamilton Properties brought suit. AIC promptly moved for summary judgment, and Judge Jane J. Boyle granted the motion on July 7, 2014 in an opinion that contains a thoughtful discussion of three of the principal defenses that insurers have to the all-too-frequent claims for hail damage to roofs. When covered and excluded perils combine to cause an injury, the insured must present some evidence affording the jury a reasonable basis on which to allocate the damage . . . When taken in the light most favorable to Plaintiffs, the evidence . . . shows only that the July Hailstorm contributed to the destruction of the roof and interior of the Property. However, it does not establish Plaintiffs’ claim that the July Hailstorm was the lone cause of the harm. Nor does the evidence raise a genuine issue of material fact on this point . . . AIC has adduced evidence to suggest that the damage to Plaintiffs’ roof and interior could have been the result of non-covered perils, such as a hailstorm from February 10, 2009 or a lack of maintenance . . . 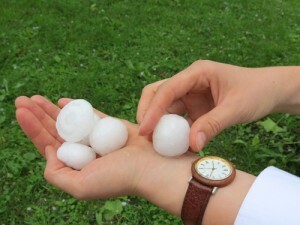 Plaintiffs have failed to make a showing sufficient to establish that they can allocate damages between the July Hailstorm and these other risks. [T]he Court concludes that the alleged damage occurred on July 8, 2009 – the undisputed date of the July Hailstorm. Accordingly, without resolving when “proper” notice was given, the Court determines that Plaintiffs waited anywhere from nineteen to twenty-seven months after the storm before contacting Defendant about their property damage. This was not prompt as a matter of law.